You’ll be hard pressed to find a more “Down on the Farm” garden fountain than this amazingly detailed, over foot-tall container water garden! A farm cistern pump cascades a constant stream of water to a spilling bucket then in to a banded barrel to create an in-home oasis and peaceful, country atmosphere. Accompanied by the lyrical sound of water music, it can be placed indoors or out and constantly recycles water from a lower reservoir. 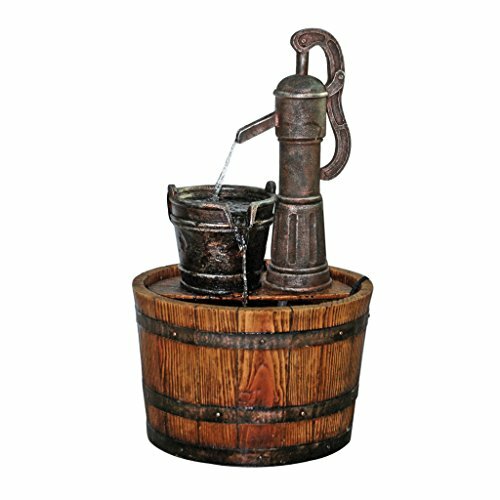 Cast in quality designer resin and hand-painted to replicate a wood and metal finish, features an integrated, UL-listed, indoor/outdoor pump. 13½”dia.x25″H. 13 lbs.